When the film version of In This Corner Of The World played at Japan Cuts and theaters this past summer there was much praise for the film. People fell in love with the film’s beautiful art and gentle portrayals of the trials of life during wartime. Personally I was mixed on the film. While I could admire the art and handling of the war time subjects (its handling of the aftermath of the atomic bomb blasts is incredibly heartbreaking) the film didn’t completely work for me. Despite seeing the film two times I couldn’t quite figure out what the problem was. I didn’t think much of it and I filed my review and moved on. And then not long after the collected version of Fumiyo Kōno‘s original manga was released in the US I was asked if I wanted to review the manga. I instantly said yes and was handed a copy of the collected graphic novel. 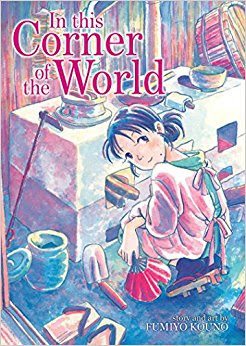 Originally published between 2007 and 2009 in All Action Manga set in the 1940’s the novel tells the story of a girl named Suzu initially as child, in the opening chapters, before switching to her marriage and relocation to a town an hour or so outside Hiroshima to be with her husband’s family. We watch has Suzu grows up, is forced to deal with war’s hardships and try to find hope in the wake of the bombing. I was moved by the tale. I lovely tale of hope and life the novel transcends being merely a war story to be a glorious look at family life. While it is most assuredly set in a specific time and place, it still manages to be razor sharp in its depiction of family dynamics. These characters are our family. Reading the manga after seeing the film I was shocked at how much better the manga was. While the film is essentially the manga (and it is a close adaption running almost a solid two and a half hours) the manga scores over the film because it manages to slip in tiny details that make the story rise up from the page. The differences are not the difference of major alterations but simply things like additional lines of dialog that make it clear when and where we are. Other lines give a shading that doesn’t seem to be in the film. The Manga also is clearly marked as to the passage of time with each chapter marked by a month and date. We are aware of how old everyone is at what point in the story. Additionally if we are aware of our history we can match up the hardship to turns in the war. The final section of the bombing and the aftermath makes so much more sense on the page since the events aren’t compressed and we have room to breathe and consider. The art of the manga isn’t the colored splendor of the film and we are better for it. Simple and a bit rough at times it beautifully puts us into Suzu’s world.And stripped of the color the story takes on a deep sense of nostalgia like looking at old photgraphs. It is a glorious example of how less is some times more. I loved the novel. Despite knowing the story from the film it still moved me. Highly recommended.